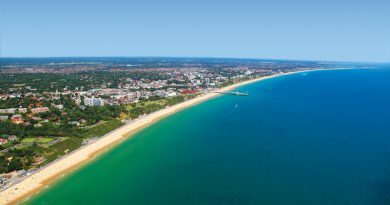 The International Education Forum (IEF) of Bournemouth and Poole is to host a brand-new festival, named ‘One World By The Sea’, which will launch in October. It will celebrate the diversity of the local community and will show-case just how welcoming the two towns are to its foreign students and visitors. The 3-day festival will include a programme of events taking place at a number of locations across Bournemouth and Poole, from Thursday 26th – Saturday 28th October, and organised by the IEF and its partners. The Festival will launch with a ‘World Discovery Day’ event on Thursday 26th at Bournemouth University International College on Holdenhurst Road from 12 – 3pm. This FREE inclusive community event will be an opportunity to learn about the 20 countries that Bournemouth and Poole have a geographical connection with along their lines of longitude and latitude. It will feature a talk by the inspirational endurance runner Peter Thompson, who ran 44 marathons, in 44 countries on 44 consecutive days, as well as some 15-minute internationally-themed challenges such as testing your chopstick skills, learning to say hello in 10 languages, and writing your name in Arabic and Chinese. There will also be a selection of international foods and flavours to try, an interactive ‘world rhythms’ drumming workshop, and free themed face-painting for younger visitors. The ‘One world, Many Voices’ world music show event will be held at Eden Garden Café Bar in Bournemouth from 7pm – 10pm on Thursday 26th October. This promises to entertain with an impressive line- up of musicians and includes a 60-drum session, involving the audience. Other international performances will follow, completing a fun evening of diverse musical talent. Entry is FREE to over 18s but space is limited and the organisers are urging visitors to arrive early to secure a good spot! The Carnival Club Night at Eden Garden Café Bar follows directly on from the ‘One World, Many Voices’ event, starting from 9.30pm and continuing till late. This will be a vibrant evening of international dance music, hosted by a Cuban DJ. The evening will start with an amazing, eye catching samba carnival procession from the Triangle in central Bournemouth to Eden Bar. Entry is FREE. An International Family Day kicks off in The Triangle area of Bournemouth on Saturday 28th from 11.00 – 4.00pm where there will be something for locals, visitors, students and families alike. International acts performing live music from across the globe will take you through the day with an array of singing, dancing and cultural demonstrations. Prepare to be entertained by a Chinese Lion Dance performed by ‘Dragon of the South, traditional Bulgarian dance group ‘Zdravets’, African 7-piece band ‘Afro Tallawah’ who will get you on your feet with their Afro-reggae, and Latino band ‘Mambo SantaMaria’. Bournemouth Male Voice Choir will also show case their musical heritage and contemporary compositions, presenting a diverse musical landscape sure to impress. There will also be a good selection of different international food available from a range of outlets, plus traditional handicrafts and themed face painting for children. Event organiser Rachel Woodward-Carrick, Director of Bournemouth University International College enthused “We are thrilled to be able to offer a varied programme of events that for this inaugural festival and hope there is something for everyone to enjoy. We would urge anyone interested in attending any of the events to visit our web site www.oneworldbythesea.co.uk where all the latest information and details are available to view. Also, please follow us on Twitter @1WorldByTheSea , Instagram @1WorldByTheSea and Facebook www.facebook.com/OneWorldByTheSea where you can enter a competition to win a meal for 2 at one of the Urban Guild restaurants in Bournemouth or Poole. ‘One World By The Sea’ fringe events are also taking place across town. These include two events organised by prestigious Chinese fashion house, Jiang Chi Pao, to celebrate 100 years of the traditional Qipao style of dress in modern fashion. The first is an engaging talk and demonstration at Bournemouth University International College on Friday 27th October at 2pm. This will be followed by a fashion show to show case the beauty of the different styles of Qipao in the Kings Hall Theatre at The Royal Bath Hotel at 1.30pm on Sunday 29th October. Tickets are £12 (concessions available at £10).To book a ticket email: Qipao.contest@gmail.com or call Freephone: 0800 264 1681. The Libertine Pub in Westbourne will be hosting a free tasting session of Italian pizzas from their wood-fired oven on 26th October from 5pm – 7pm. The Vintage Lounge and Cinema in the Arcade in Westbourne will be hosting international films with sub titles on each day of the festival at noon. Visit www.bournemouthcolosseum.co.uk for further details. Gin Jams Wine & Gin Bar on Seamoor Road in Westbourne will be hosting an international food and drink quiz on Thursday 26th October which will include a cheese tasting round and a wine tasting round. £1 per team member to enter the quiz. Start time 7.30pm. Ojo Rojo Mexican Restaurant in The Triangle will be celebrating the ‘Day of the Dead’ Mexican Festival which is a celebration of life. There will be live music each day and on Saturday afternoon they will be a hosting venue for the live music festival, Oxjam. The new Metropole Market on the Lansdowne on Sunday 29 October will feature an ‘international courtyard’ at Bournemouth University International College, with live music and delicious food from around the world. February 26, 2019 LGO Office Comments Off on Bournemouth Beach named as UK’s best beach for second year in a row!